I am so happy to present my very first metal tier tray post! You would have to be living under a rock not to notice everyone posting pictures of their decorated tier trays on their blogs and Instagram accounts. Tiered trays are the hottest home decor item on the market today, and after buying my own tray and decorating it, I can see why: they're FUN! I bought my tray for around $20.00 at Hobby Lobby. There are so many different styles of tiered trays on the market. I chose a distressed white tray to go with my white dining room. I decorated my tray for Easter using some items I already owned, and then I bought the rest at Hobby Lobby. Everything was 40% off, so I got some great deals. The pink coffee mug I purchased at Ikea almost a year ago, and the eggs I already had. The peonies are from the Dollar Store. Everything else is from Hobby Lobby. The "grass" was a square of grass that I cut into pieces to fit my tray. This filler really completed the Easter look of my tray. It also pushed all the objects up a bit so they could be seen better. Various levels are so important when creating your tray. Don't just fill your tray, create levels with candle pillar holders, cupcake stands, and coffee mugs. Now if you're new to this trend, you're probably wondering what to put in your tray. The answer: Anything you want! I've seen just about everything and anything in these trays. 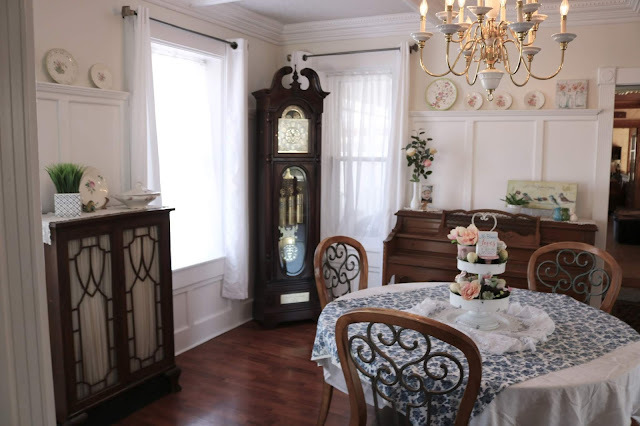 My advice is to always put in some floral or greenery, and use different sizes of objects. My tray sits in the center of our dining room table. I plan on leaving it there and changing the decor with the seasons/holidays. As I was creating my tray, I started to think about why they are so popular. I think with the whole "Minimalist" movement going on in our society today, it's a way of decorating on a very small scale that doesn't involve a lot of money, time, or totes and totes of decorations. It literally took minutes to put this cute tray together and when Easter is over, everything will fit nicely in a shoe box. I love it! 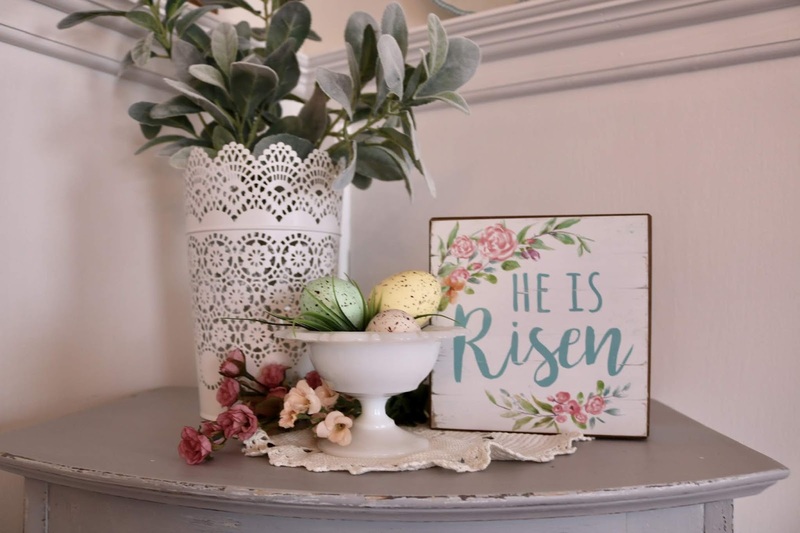 I did put a few Easter decorations out elsewhere in my home. 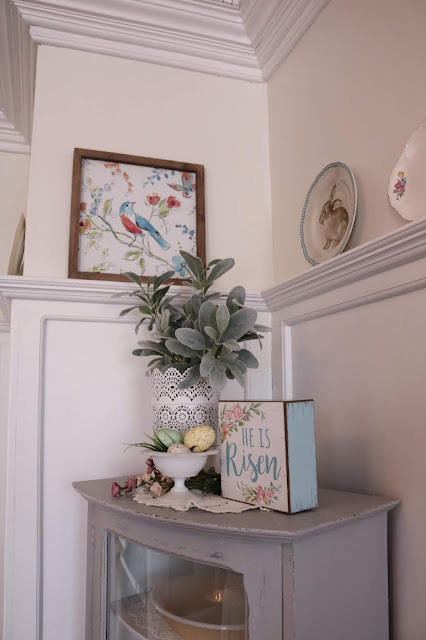 I hung an Easter welcome sign outside my front door, and I also created this Easter vignette on my newly painted dining room hutch. 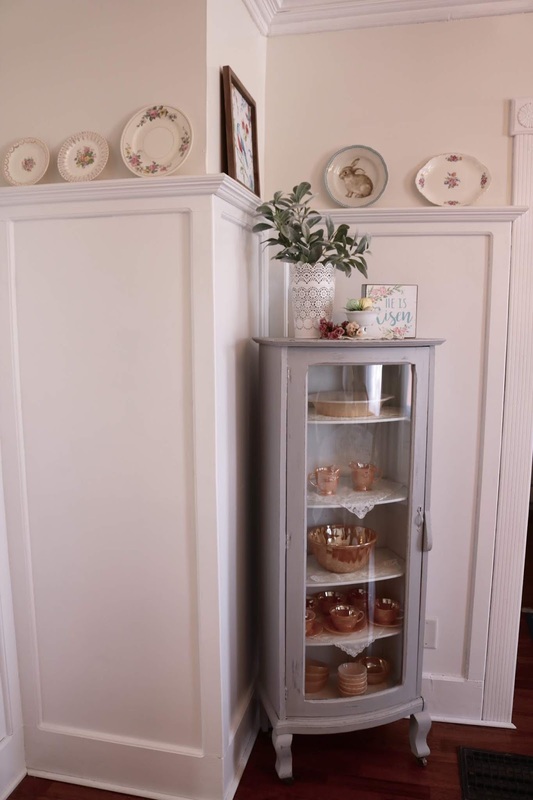 Everything on the hutch I already had except the grass and the "He Is Risen" sign. I bought those at Hobby Lobby. Gosh, how I LOVE finally having a Hobby Lobby in my hometown. I love their products. I use to have to drive almost an hour to go to a Hobby Lobby store. They are hands down the best arts and crafts store in America. The metal lace vase is from Ikea. I filled the milk glass bowl with grass and three faux eggs. I just love the wooden sign from Hobby Lobby. It's so pretty. 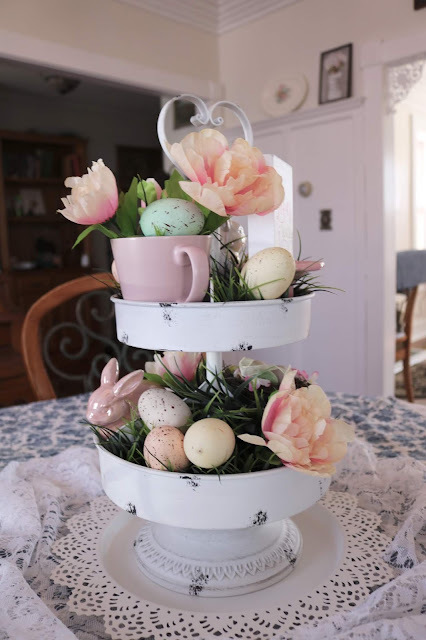 As soon as Easter is over, I plan on decorating my metal tier tray for summer. Lemons are super hot in home decor so I was thinking of doing a lemon themed tray. So what about you? Have you jumped on the metal tier tray decor bandwagon yet? I'd love to hear from you! I must be living under a rock, LOL. 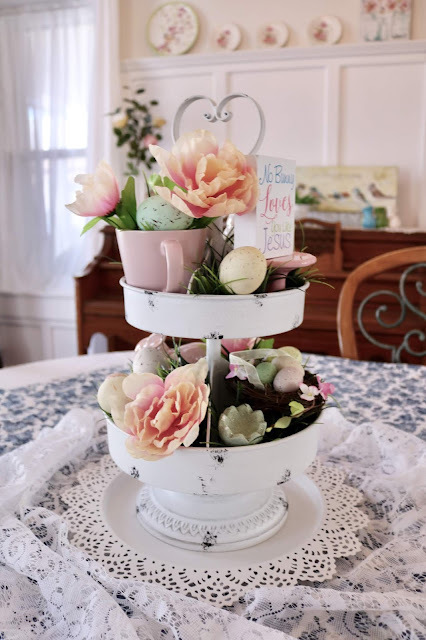 I'm pretty sure I've seen these kinds of trays at Target but didn't realize people were using them for decorating, thought they were for food/ cupcakes. But what a great idea, I might have to do something like this as well! Thanks for the inspiration and for introducing me to something new once again! Ha ha! I guess you are living under a rock. Google #tieredtray #tieredtraydecor next time you're on Instagram or Pinterest....you'll see! It could also be who you follow on Instagram. I follow a lot of home decor accounts. Your Easter decor is so cute, lady! Thanks Linda. I so agree. 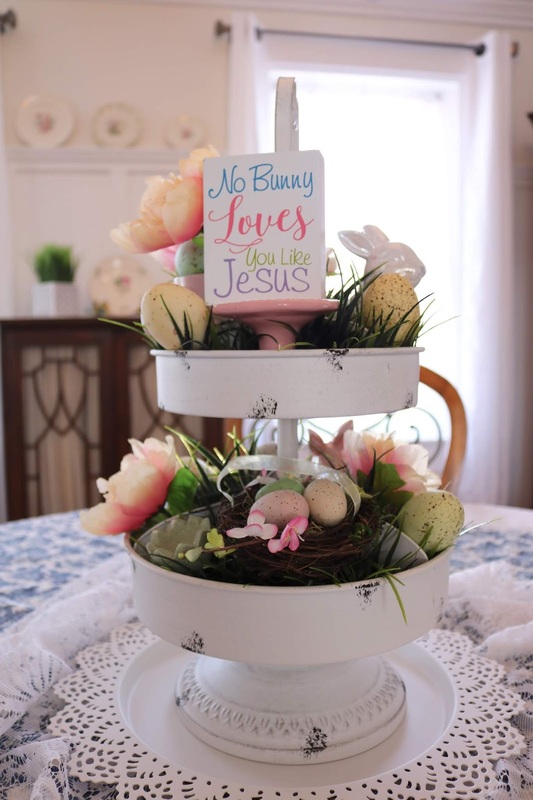 I like how I can incorporate the cute things of Easter, like bunnies and eggs, and still have the real meaning of Easter! Such a pretty tiered tray! Thanks so much for sharing your ideas with us at the Welcome Spring link party. Pinned. Your tray is so cute! 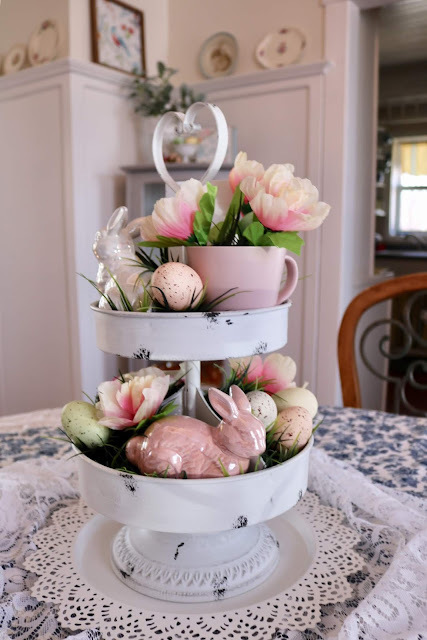 I love the fun bunnies and flowers you added for Easter! Thank you! You know, it took me awhile to jump on the trend myself. I kept thinking "Do I really need that?" I have so much home decor already and I'm trying to lead a more minimalist lifestyle. But, they really are a lot of fun, and like I said in my post, it's like decorating in miniature so you don't need to buy totes and totes of decorations for every holiday/season. I love your tray, and the using the grass as filler is perfect! I love Hobby Lobby, too, and I can't imagine not having one right down the road. How fun that you have one near now! Thank you for sharing at Sweet Inspiration! 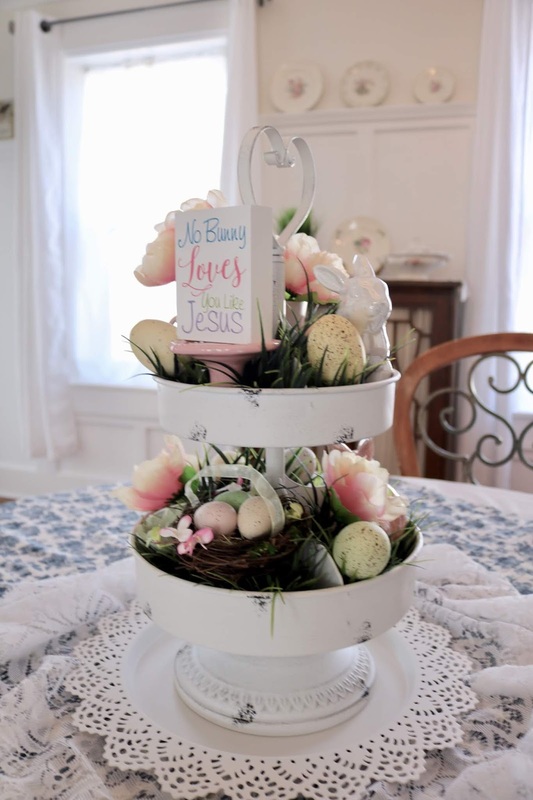 Beautiful Easter decor on this tiered tray! I love it! Pinned! Thanks so much! Now that Easter is over, it's time to create a new one! I love these tiered trays! They're so much fun!